← Discussion: Why aren't manga fans more open to OEL manga? So, as I’ve mentioned before, I’ve been working with a Korean company named iSeeToon to re-write and edit webtoons (they’re a lot like webcomics) for the iPhone in English. 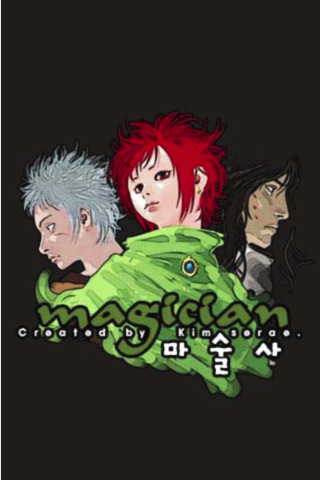 Magician is about two kids, Eremi and Enze, whose adventures start when they challenge the infamous mage, Edermask. Just what kind of guy is he if he doesn’t mind taking two pre-teens along for the ride and just why is everyone out to get him? The mystery starts here! You can download the app here or search for “Magician” in the iTunes store and it will come right up! Sorry for this shameless plug, guys, but since this is the first English language product from iSeeToon, they need all the love they can get right now! Even if you just download the app and give me or the company some constructive criticism, you’re helping us out a lot. Not to mention, if you buy any of the chapters, you’re keeping me gainfully employed. Please let us know what you think about Magician! This entry was posted in manga, webcomics and tagged iPhone, iSeeToon, Kim Se Rae, Magician, manhwa, webtoon. Bookmark the permalink. Actually, I think The Great Catsby and X-Diary (NETCOMICS) were the first Korean webtoons to be published in English. One thing I think that really needs to stay away from all comics, especially the fantasy world-building chapters like the first two, are the emoticon letter faces. from frame 52, chapter 1, is not acceptable text in my mind – the fact that you have to draw a face in the text of the comic means that the actual imagery of the comic is not sufficient to deliver the emotion you want the T-face to represent. Another thing I disliked was how distractingly the sound-effects words stood out from the art, and in certain places, actually occluded the art. The sound effects should at maximum accentuate the art, never occlude it. Personally, I also found some of the sound effects completely unnecessary. For example, frame 96, chapter 1. “Stare” is not a sound effect, and he’s obviously staring. I would shy away from using sound-effect words that don’t actually describe a sound in the future. Ah, well… It was there in the original Korean text and since that was the creator’s choice, I figured I’d be faithful. I can see how it’d be annoying to some, though. I agree with you on the sound effects… I certainly am not used to translating all those sound effects (working for TOKYOPOP, we don’t usually translate them.) Certainly it will be something I will have to watch out for since this was my first time adapting a series as well as editing it. If you wouldn’t mind, they have a survey up and any more criticism you could share with them would be VERY helpful. This is their first venture publishing for an English-speaking audience, so they’re still determining things like their editorial style. Here’s the link: http://bit.ly/cQnuNB Please try to be as clear as possible since English isn’t their first language. Alex> Thanks for comments. Caught by cold at now, can’t do proper reply. However leaving reply, to let you know we iSeeToon team saw it. Thanks.